Years after the Salem witch trials one witch remains. She just doesn't know it... yet. 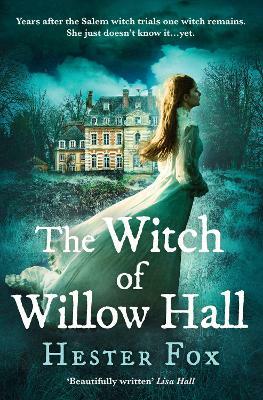 But a subtle menace haunts the grounds of Willow Hall, with strange voices and ghostly apparitions in the night, calling to Lydia's secret inheritance and leading to a greater tragedy than she could ever imagine. Readers are spellbound by the The Witch of Willow Hall! Hester Fox comes to writing from a background in the museum field as a collections maintenance technician. This job has taken her from historic houses to fine art museums, where she has the privilege of cleaning and caring for collections that range from paintings by old masters, to ancient artefacts, to early American furniture. She is a keen painter and has a master's degree in historical archaeology, as well as a background in medieval studies and art history. Hester lives outside of Boston with her husband and two cats. The Witch of Willow Hall is her debut novel.